A golf-lover's dream, you and a guest are welcome to play your hearts out with unlimited rounds when you book one of these scenic golf getaway hotel packages. Chicago is surrounded by gorgeous courses, including our very own award-winning 18 holes, where food and drinks are just as important as the ball. That's why we add vouchers for lunch and 2 drinks for each of you, along with a golf cart. Resort tax and fees are not included. Unlimited golf from 1 pm on the day of arrival and Noon on the departure day. Tee times are required, please call 1-630-584-4914 extension 2. Tee times can be booked up to 21 days in advance. 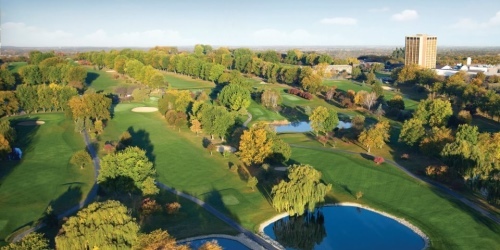 When calling 630-584-6300, please mention you saw this golf package on ChicagoGolf.com. Pheasant Run Resort reserves the right to change price and offer at anytime. Prices and offer are subject to change without notice. ChicagoGolf.com is not responsible for errors posted in this golf package.